Description: WM 236 was later WM 7170. Description: Digital image from Kim E. Piersol original 35mm Kodachrome transparency. Reading Rutherford Yard. Description: An EMD F7A on display at the Baltimore & Ohio Museum in Baltimore, September 1982. Description: Nice nose and cab shot by Mike Susalla of Western Maryland #236 built by EMD in December of 1952. Description: Located at the B&O RR Museum. Description: Nicely restored F unit. Description: Old EMD F7 from the WM. Contrary to popular model makers, the WM F units never saw the Chessie System paint scheme. They were all retired shortly after the merger. 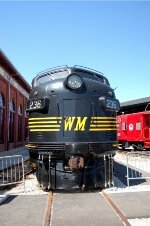 Description: WM 236 at the B&O Railroad Museum. Description: The building behind WM #236 now houses the C&O #1604, #490, and other locomotives. Description: WM 236 on display at the B&O RR Museum in Baltimore,MD.